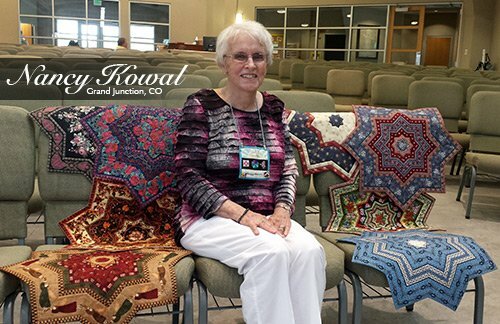 Meet Nancy Kowal. She is a local gal here in Grand Junction, CO and is a proud member of the Sunset Slope Quiters. During the August meeting, I was watching the Show-n-Tell portion of the meeting and to my amazement I glanced up to see more than half a dozen of these wonderful blocks. I'll be totally honest, I didn't recognize the block at first. Then she mentioned my tool, the Squedge 22.5. What a charge that gave me to see so many beautiful samples using one of my designs! This is a table topper design we offer a free pattern for on our site, February Table Topper. You can see from Nancy's wonderful work how much fun she has had making these little projects! Meet another friend, Ann Sanders. 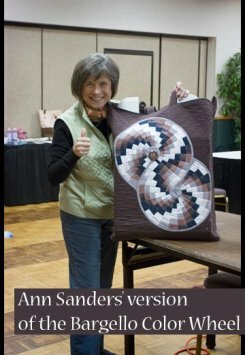 She is just an amazing creative quilter. 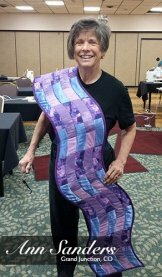 Below is a bag she made using the Bargello Color Wheel as an adornment. It's such a fun sample and travels with her to all her classes! On the right is her Simple Curves table runner she started in the Thread Bear class back in January. She changed up the design to make it long and narrow which just works so well! What a beautiful piece! We've met so many friends along the way and we hope to meet more soon!